Hillary Clinton saw the news that Jeff Sessions was fired and Matthew Whitaker was named acting Attorney General and she could not have been happy. Most Democrats were not, they think Whitaker is there to stop the Mueller probe, but Hillary had more to worry about than most. “The most disturbing aspect of Hillary Clinton’s continued blame game is that she still doesn’t think there was anything wrong with recklessly handling highly sensitive and classified information, intentionally instructing her staff to do the same and then lying to the entire world about it at the United Nations of all places. The American people entrusted her with a great responsibility to put our national security above her own political interests and the fact that she is now asking them to forget her egregious actions is downright shameful. 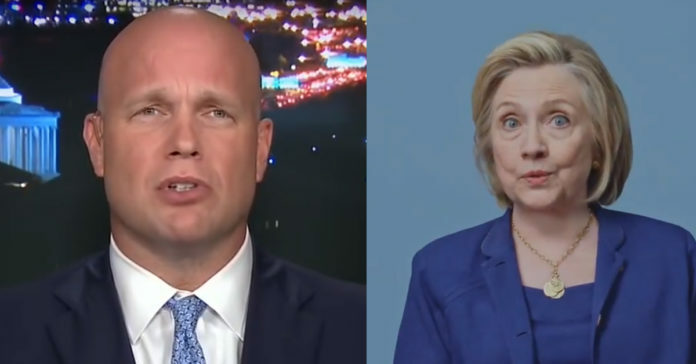 From USA Today: Matthew Whitaker, who was named interim attorney general Wednesday after Jeff Sessions was fired, argued two years ago that Hillary Clinton should have been criminally charged. In an opinion piece for USA TODAY, Whitaker disagreed with then-FBI Director James Comey that “no reasonable prosecutor” would indict Clinton for handling classified documents as secretary of State on a private email server. “I believe myself to have been a reasonable prosecutor, and when the facts and evidence show a criminal violation has been committed, the individuals involved should not dictate whether the case is prosecuted,” wrote Whitaker, a former U.S. attorney. He penned the piece while serving as executive director of the Foundation for Accountability and Civic Trust, a conservative watchdog group.